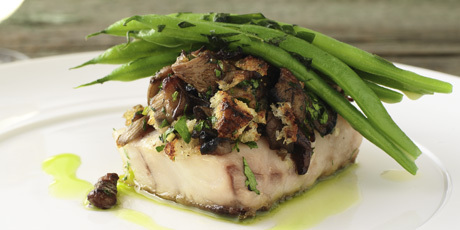 Broiled snapper topped with mushrooms, tarragon beans and homemade croutons. 1. Turn broiler on high. Lightly grease oven-proof dish or baking tray with 1 tbsp olive oil. 2. Arrange fish in dish and season with 1 tbsp olive oil, salt and pepper. 3. Gently pack mushroom topping on top of fish, about 1 inch think. 4. Drizzle additional olive oil over topping and broil on middle rack until fish is just cooked through, about 7-8 minutes. 1. To prepare green beans, blanch briefly in boiling salted water. Drain. 2. Heat butter in large pan over medium heat. Add green beans and saute to warm through. 3. Add lemon juice and tarragon; remove from heat. Season to taste with salt and pepper. 1. To prepare mushroom topping add 1 tbsp olive oil to large pan and bring to medium high heat. Add portobello and button mushrooms; cook until lightly coloured, about 3-4 minutes. 2. Add oyster mushrooms and continue cooking another 2 minutes. 3. Add roasted garlic and green onions, stirring until garlic is mashed and combined with mushrooms. 4. Deglaze pan with 2 tbsp white wine; simmer to reduce slightly. Season with salt and pepper and remove from heat. 5. Transfer mushroom mix into large bowl and combine with croutons, parsley and about 1 tbsp olive oil. Season with more salt and pepper if necessary and set aside. 1. Dice bread into 1/4 inch cubes. 2. Toss in olive oil and bake until dry in low 275 degree oven until light golden. 1. Puree herbs in a blender. Slowly stream in the oil, until mix is smooth and vibrant green in colour. 2. Strain the oil through a coffee filter or cheesecloth sitting inside a strainer, overnight. 3. This oil keeps well, refrigerated, for up to two weeks.